Please note: I have chosen to participate in a campaign for Proctor and Gamble. I received free samples and will receive a fee for posting here, however the opinions expressed are my own. I am in no way affiliated with P&G, and do not earn a commission or percent of sales. Great innovation means more than just creating something new – it means improving our lives. Our latest adventure is building a passive solar home in a rural area. We plan to use a natural source of energy, thus we plan to reinvent the way we warm and cool our home. Procter & Gamble has recently reinvented the process of cleaning our clothes with Tide Pods and Gain Slings. These revolutionary new laundry pacs provide excellent cleaning and freshness, with minimal time and effort. 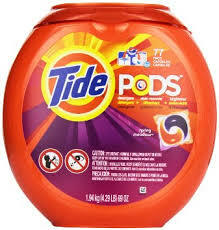 Tide Pods deliver maximum laundry cleaning with great design, performance and convenience. Their cleaning power delivers the stain fighting clean I need to look my best. Having one product that cleans, brightens and fights stains makes doing laundry so much easier. I have always loved the fragrance of GAIN. 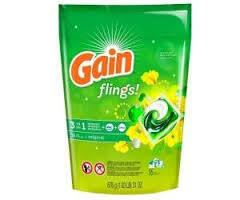 Now there are Gain flings! These offer a great long-lasting scent experience, thanks to a 3-in-1 benefit; Gain detergent with the added cleaning power of OxiBoost and the odor fighting power of Febreze in a convenient, pre-measured pac. Gain Flings come in three different scents. Not only are the pacs easy to use, but thanks to their great smell, I know I can fill my world with an awesome scent, so important especially in the summer! Like any household cleaning products, it is essential that you keep these laundry pacs away from children. Be sure to seal the pacs up and then store them far from pets and kids. As a member of The bLink Marketing Network, I participated in this sponsored conversation written by me on behalf of Proctor & Gamble. The opinions and text are all mine. The Pods are so convenient, especially for kids who are old enough to do laundry, but who sometimes use too much or not enough detergent. I love the smell of the Gain Flings. It’s so fresh, and fresh makes me happy!